Partner Central | WEX Health Cloud | WEX Inc.
WEX Health empowers our partners with robust sales and marketing support. 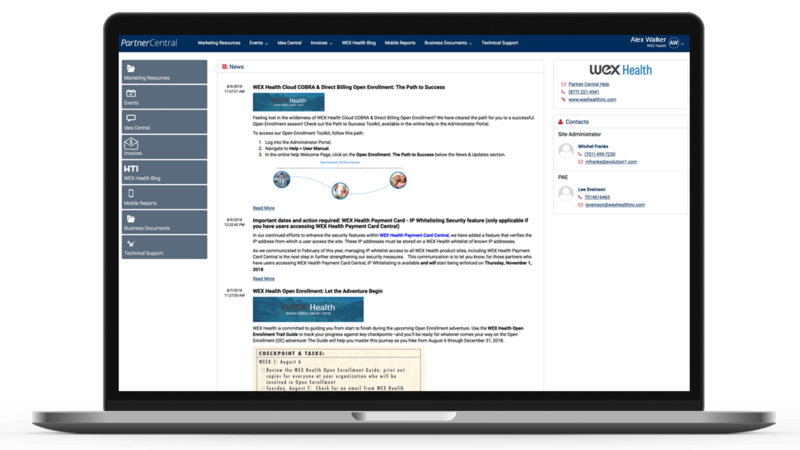 Partner Central gives WEX Health customers a secure, self service portal for WEX Health Cloud—including premium sales, marketing, and operational support. In fact, Partner Central is used by 80% of WEX Health partners to improve sales and marketing. With Partner Central you can access upcoming WEX Health webinars and training, product-related announcements, and industry news—as well as the newest sales and marketing tools and resources available. Discover all the things you can do with Partner Central. Partner Central is a secure, self-service portal exclusively for WEX Health Partners. Easily access all things WEX Health.